Type: Sempervivum arboreum. Linné (Lectotape. Ausgewählt von Liu). 1989. Greenovia Webb & Berthelot 1840. Aldasorea Hort ex Haage & Schmidt. 1930. 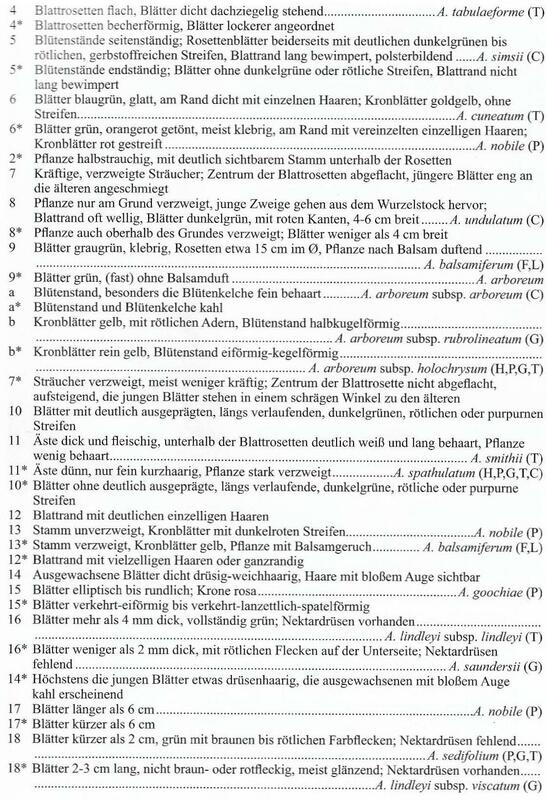 Mehrjährige Sträucher, einzeln bis polsterbildend, stammbildend, verzweigt oder unverzweigt, Rosetten formend, Blätter variabel, fleischig, bewimpert, Blüte variabel, gelb rosa, weiß, blassgrün , gestreift braun, rot. Perennial shrubs, solitary to cushion-forming, brachiate to branchless, rosettes forming, leaves variable, succulent, ciliated, flowers variable, yellow-pink, white, pale green, brown striped, red. Kanarische Inseln, endemisch, Madeira, endemisch, Marokko, endemisch, Kap Verdische Inseln, endemisch, Afrika, endemisch. Aeonium wird weltweit in tropischen, subtropischen und frostfreien Klimaten kultiviert und in den entsprechenden Ländern oft eingebürgert. Zwischenformen mit entsprechenden Namen sind zahlreich publiziert. Aeoniums are in cultivation in tropical, subtropical and frost-free regions troughout the world, often adventive and naturalized in these areas. 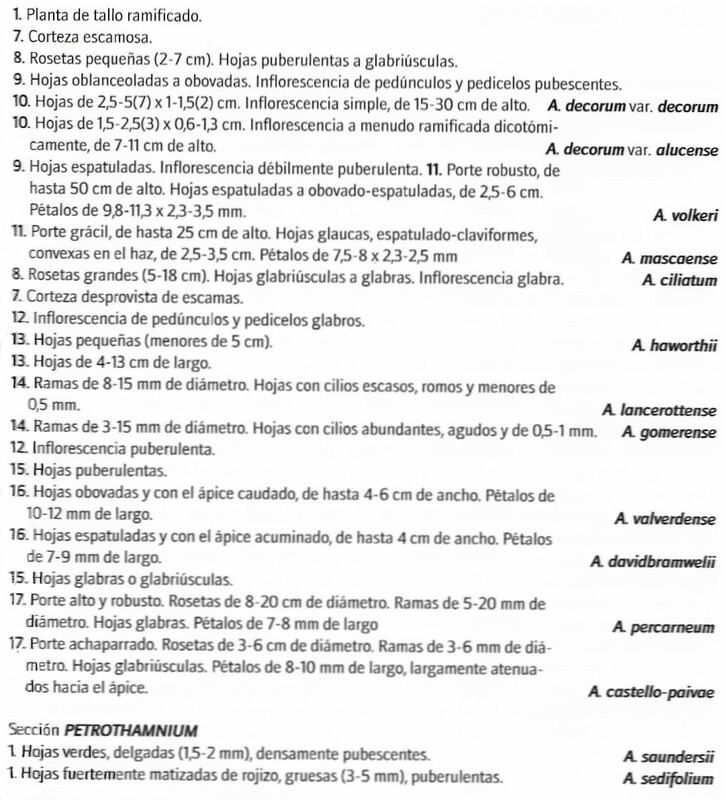 Numerous hybrids and intermediate forms are published. Einzeln, kleine bis grosse Rosetten formend. Solitary, small till large rosettes forming. Small, densely branched low bushes. 2 Stem surface reticulations flush with the general stem surface. Bañares Baudet, Ángel (2015): Las Plantas Succulentas (Crassulaceae). Endemicas de las Islas Canarias. Edital Publicaciones Turquesa S. L. Santa Crzuz de Tenerife, Islas Canarias. pp. 280. Bramwell, D. & Bramwell, Z. (1974: Wild Flowers of the Canary Islands. Thornes, Ltd. Leckhampton. pp. 261. Farfield, K. et al. (2004): Phylogenetics and evolution of the Marcaronesian members of the genus Aichryson (Crassulaceae) inferred from nuclear chloroplast sequence data. Pl. Sys. Evol. 248: 71-83. 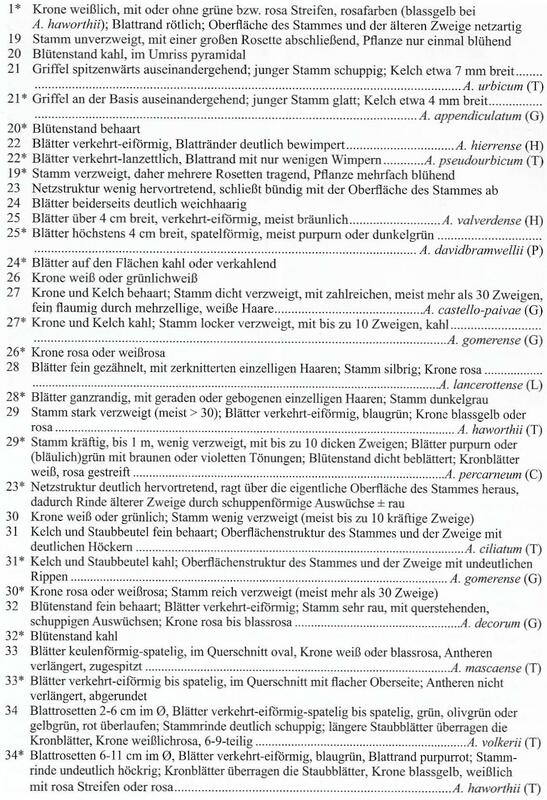 Kunkel, G. (1987): Die Kanarischen Inseln und ihre Pflanzenwelt. Gustav Fischer Verlag, Stuttgart, New York. pp. 202. Liu-Ho-Yih(1989): Systematic of Aeonium (Crassulaceae). Spec. Publ. 3. Nat. Mus.. Taichung, Taiwan. Lodé, J. 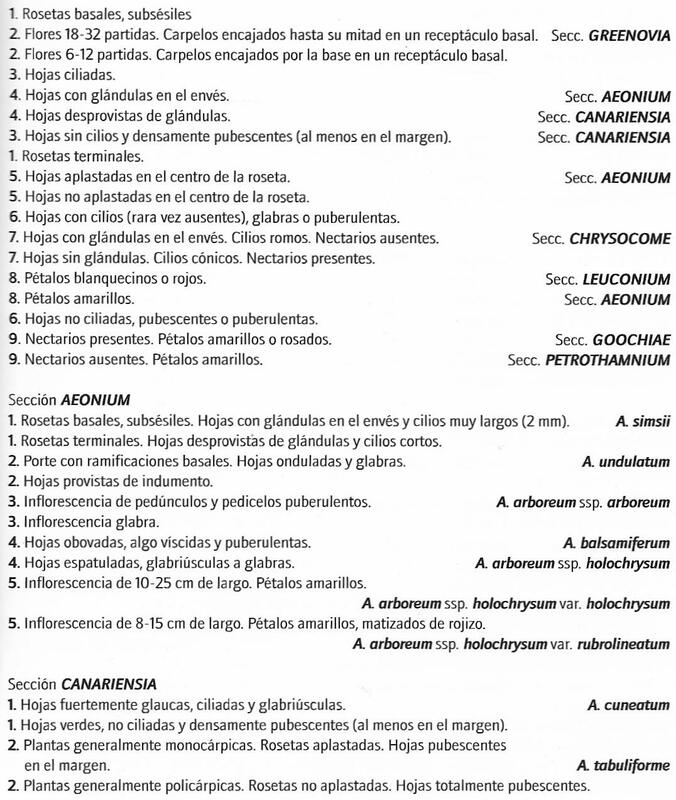 (2010): Plantas Succulentas de las Islas Canarias. Turquesa, S. L. Santa Cruz de Tenerife. pp. 368. 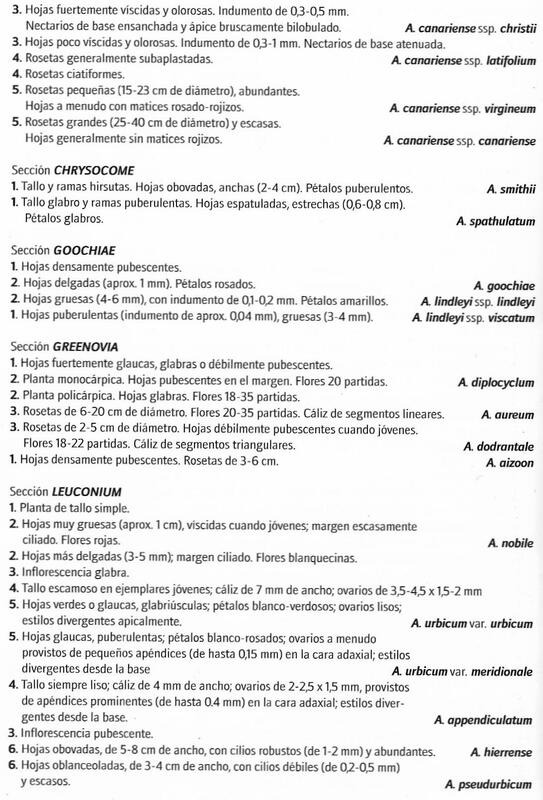 Mes, T. (1995): Phylogenetic and systematic implications of chloroplast and nuclear space sequence variation in the Macaronesian Sempervivoideae and related Sedoidae. 30: 4. Evolution and Systematics of the Crassulaceae. Leiden, Backhuys, Publ. Murer, T. et al. (2016): Die Farn- und Blütenpflanzen der Kanarischen Inseln. Printing & Binting,, TZ Verlang und Print GmbH, Roßdorf. pp. 1310. Nyffeler, R. (2003): Aeonium (Crassulaceae)11-20. Ullmer Verlag, Stuttgart. Praeger, , R. L. (1932): An account of the Sempervivum group. . London. Roy. Hort. Soc. pp. 265. Voggenreiter, V. (1974): Geobotanische Untersuchungen an der natürlichen Vegetation der Kanaren.